Google was granted a local SEO patent this week to enable them to check whether people are following recommendations in search results to visit geographical locations – to see how many people actually visited those places. And it’s probably good for many businesses to have Google recommending that people visit them. For example, people living near a certain restaurant may be recommended as a place they might like to go; and the patent determines whether or not people may be following those suggestions. In some implementations a computer-implemented method may be provided that includes the steps of: providing a suggestion to one or more users, where the suggestion may be indicative of a potential user activity at a given geographic location; determining locational data for the one or more users; determining, based on the locational data, how many of the one or more users visited the given geographic location after receiving the suggestion; and adjusting a ranking of the suggestion based on a determination of how many of the one or more users visited the geographic location after receiving the suggestion. Cellular Tower Signals and Wi-Fi Signals are available in an area that can be used to check upon visits to those geographic locations. For such ranking suggestions to be demoted, the patent says that a certain threshold number of people who received recommendations for a specific location must have failed to visit that location. The visit may be required to meet a visit duration time to the geographic location, and the impact on the ranking may be based further upon the visit duration time. Methods and apparatus related to adjusting the ranking of a suggestion for a geographic location based on determining how many of one or more users visited the geographic location after receiving the suggestion. In some implementations the one or more users may belong to first grouping of users and the ranking may be adjusted only for suggestions to the first grouping of users. In some implementations it may be determined if a second grouping of users visited the geographic location after receiving the suggestion. In some implementations a property of the given geographic location may be determined based on a comparison of how many of the second grouping of users visited the given geographic location after receiving the suggestion and how many of the one or more users visited the given geographic location after receiving the suggestion. The suggestion system 130 may provide suggestions for a given geographic location to one or more users. The suggestions may be indicative of a potential user activity at the given geographic location. For example, the suggestion may be for a fine dining establishment in downtown, for watching a sporting event at a sporting bar and grille, for a menu item at the sporting bar and grille, for a book reading and/or signing by a best-selling author at a bookstore, for a book sale at the bookstore, for an opera, for a musical performance, for an art exhibit, for a nearby park, for purchase of merchandise, for travel-related promotions, and so forth. In some implementations one or more of the suggestions may be provided at least in part based on rankings that are associated with the suggestions. The ranking of one or more of the suggestions may be determined by the ranking system 140. In some implementations the ranking system 140 may adjust an existing ranking associated with a suggestion. In some implementations the ranking system 140 may initially determine a ranking for a suggestion. I did write a post about a Google patent this past summer that offered Future Directions for Google Maps that told us about business recommendations showing up in search results that fit with this patent as something that Google could begin to offer. I also just wrote about a Social Where Next patent that provides suggestions of places to go for members of social groups. I could see Google checking to see if people from those groups followed those recommendations. For example, one or more users may have indicated an interest in sports-related activities, and the suggestions to the one or more users may include suggestions to purchase tickets to upcoming sporting events, suggestions to visit a sporting goods store, suggestions to join a sporting league, and so forth. As another example, one or more users may have purchased tickets to a particular theater in the past, and the suggestions to the one or more users may include suggestions to see the upcoming productions at that theater. As another example, one or more users may have indicated interest in a particular musical group, and suggestions may be provided to the one or more users for venues where the group may be performing in the future. As another example, one or more users may have responded positively to a particular type of suggestion in the past, and suggestions may be provided to the one or more users that are of the same and/or similar suggestion type. In some implementations the physical location of the user may be based on locational data described herein. For example, a user’s physical location may be identified as being in the downtown area and suggestion system 130 may provide suggestions for downtown restaurants to the user. Likewise, suggestions for local suburban restaurants may be provided to users that are identified as being in a particular suburban area. As another example, a user in the vicinity of a mall may be provided suggestions to visit one or more stores in the mall. As another example, the user in the vicinity of a mall may be provided with suggestions to participate in one or more ongoing promotional events at the mall. In some implementations the physical location of the user may be based on identified locational data as described herein. Locational data may be based on one or more actual and/or indicated visits from users such as those discussed herein. For example, locational data may be based on one or more of locational queries, geolocational data from mobile devices and/or other client devices 110, financial transactions at a given geographic location, user indications of visits to a given geographic location (e.g. check-ins), and so forth. In some implementations utilized locational data may optionally be restricted based on one or more aspects of the locational data. For example, locational data may be restricted based on the geographic location, based on one or more suggestions associated with the locational data, and/or one or more groupings of users. 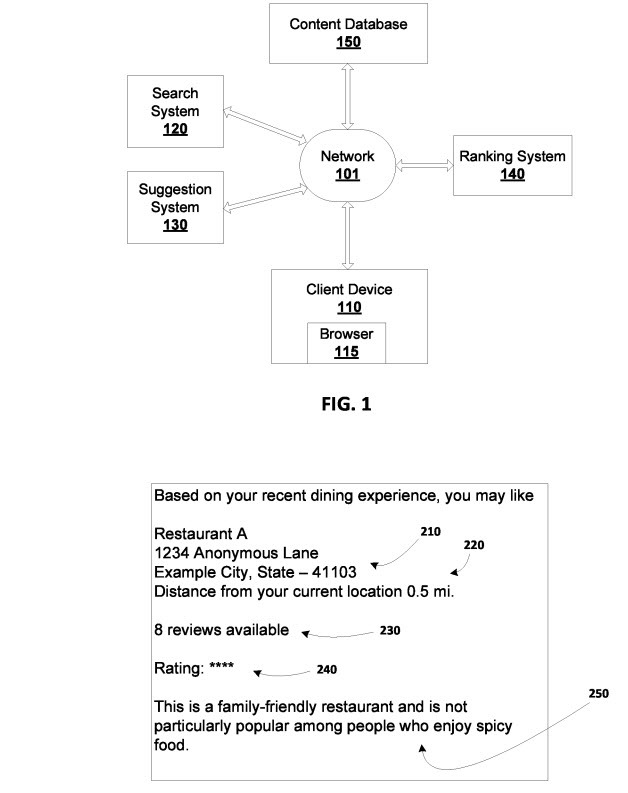 The patent tells us that it might offer more data to increase a “confidence level” that a person might actually travel to a place recommended, such as whether they visit a social network listing for a place or whether or not a search might have searched for the place, or read reviews for it, or in the instance of a restaurant, have read or viewed the menu for the restaurant after a suggestion to visit the restaurant. For example, the grouping of users may include users that share a similar age range, such as teenagers, college undergraduates, retirees, and people over forty, couples in their thirties, and singles over fifties. As another example, the grouping of users may include users that are grouped as a certain user type based on one or more shared attributes. As another example, the grouping of users may include one or more users from a common region, such as a zip code, a county, a business district, a city, a township, a municipal area, a state, and/or a country. For example, in some implementations, the common region may include one or more of the eastern, southern, midwestern, southwestern, central, and/or pacific regions of the United States. Also, for example, other designations such as “small town”, “medium-sized town”, “small city”, and “large city” may be used to identify a common region. In such an instance the restaurant property may be determined to be “not a family friendly restaurant”, “not popular among users with children” and/or “not popular among users in the second grouping of users” due to the predominantly low percentage of users with children determined to have visited the restaurant after receiving the suggestion. The patent isn’t telling us much at this point about why certain geographic locations might be recommended. Once we start seeing more geographic recommendations from Google, we may be able to identify what types of things might be influencing those suggestions. For instance, there isn’t mention of the use of Schema in the patent, but we know that Schema can influence whether or not events at certain places are noted in search results, so using those could potentially be a positive thing to implement for a businesses website. These google recommendations will help everyone about map tracking and transparency to track the places. Nice article. I actually find it rather annoying when I visit a location and take a few photographs. Only to be asked by Google a few hours later if I want to share them and the location I have visited. I really find it as though Big Brother is watching over use a little too much! 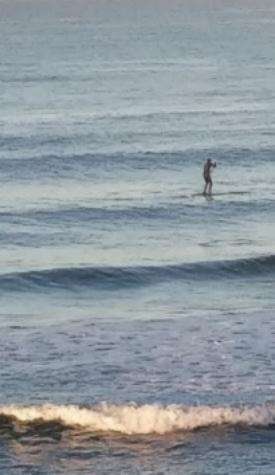 Maybe I should revert to an old fashioned camera or turn the GPS off on my phone when I shoot pictures! Great article, very well written information. I think this is an interesting patent, showing Google going much deeper into their local places data. It sounds like are attempting to build an algorithm to create a ‘bounce rate’ for physical IRL interactions with local places. I’ve noticed a big push with Google maps asking me to add more detail into every place I visit, or places that happen to be nearby (what are the hours? Is it child friendly?, Do they sell X product?, Is this X type of store, etc), so this makes a lot of sense in the big picture. Once they have a solid base, they can start to build physical visitor metrics, which will (I assume) determine ranking and better suggestions similar to the metrics they use for ranking web pages. It’s definitely interesting to see the evolution of search unfolding into the physical space. I have seen same thing….google guide asking so many question in the place visited. I went through the article really well crafted and deeply researched. Never thought that google is tracking so much. Reading the article changed the complete overview. I’m wondering if you’ve snuck a peek at my list of things to cover in blog posts – There’s another local search patent that I am planning to write about that adds an interesting element. Google does seem to be paying more attention to their mapping of the physical world. I think you will find that post interesting, too. It’s becoming a matrix of digital russian dolls! Or a fantastically digitally animated dot to dot. So, presumably they plan to be constantly tracking through all usage of one’s Google account + wifi hotspots / carrier signals? Not just maps usage? On a separate note – it’s interesting when you type the word ‘human’ into http://patft.uspto.gov/netahtml/PTO/search-bool.html just how many Wireless inventions there are getting patented!!! As we were breifly discussing last month on Twitter Bill – this certainly would aid in adding weight to reviews of places if Google can detect people have actually been to them so that they can make suggestions then verification of reviews is right there. It’s interesting to see a suggestion like the one you made turned into a patent, but it has been here, and the patent does even mention reviews. Google Maps is a tracking of actual real businesses and people whom may visit them. And with phones in their pockets that can be tracked by GPS or Cell phone triangulation or Electro-magentic mapping; google can now tell whether people do actually visit places they have recommended to them, or that they see in search results. As a new comer to the West Coast, I do use Google Maps to find my way around. I do wonder what impact my use of the “send directions to my phone” might have upon the rankings of places in search results. Now I have a good guess. Google’s been asking me a ton of questions about just about every business I’ve been within 100 yards of lately. In many cases, I’ve actually been at a different business than the one I’m being asked about (location services are evidently not 100% accurate within a range of about 100 yards). I haven’t been given any recommendations, but in the past week or two the amount of requests for reviews and answering basic questions about businesses I’ve either been to or been close to has ramped up big-time. If I recall, they even mentioned something about winning a prize or something to that effect — an incentive of some sort or other (I obviously wasn’t particularly interested in it), and implied that the more I review the better my odds of receiving said prize/incentive. I wonder how Google will handle people who like to leave reviews but turn locations services off. Will they still allow them to review? Devalue the reviews? Treat them the same as reviews from people Google knows for certain were either at or near a business they’re reviewing? I like the direction Google is heading with this. As someone who’s owned a business in the past, I know from experience that people who have perceived negative experiences are in my estimation about one-hundred times more likely to leave a review than those whose experiences were positive. The way Google is going about it, I think they can offset the imbalance of negative-to-positive reviews found on other review sites whereby many only go to leave reviews when they’re dissatisfied, while the company they’re reviewing may have had one-thousand other customers who were happy with their experiences and never bothered to review them. Granted, my former-business didn’t receive many negative reviews, but the threat of one was always in the back of my mind, and I did encounter customers who used that threat to bully me and/or my staff into giving them things without them having to pay for them (or receive a refund when not appropriate to do so). My final take on this is how will it affect businesses whose service is getting a company’s happy/satisfied customers or clients to review them? Will the demand for these businesses decrease if Google is using GPS to track everyone’s movement and asking them to review every business they pass throughout the course of a day? It’s interesting to think about how “duration” of stay could play into the algorithm in the future. I understand validating with a certain time of stay (to ensure they really experienced the location). But extended durations could also be a sign of poor service, not just positive signals (eg convenience store, a server taking too long at a restaurant, etc…). It would be interesting to see if they’d categorize duration by type of location to understand if time is positive or negative. Thanks for the interesting article! I had been getting many questions related to businesses I visited as well. I like that Google is asking people these types of things. I’ve noticed that sometimes I’ll be in the store next to the store they are asking about sometimes, too. I have been noticing more and more photos of places in Google, and some reviews that seem honest. I like that people are being asked many questions about businesses. Yes, I had some of those thoughts about duration from this patent as well. It’s one inf which it would be nice to be able to ask the inventors what they were thinking about when they talked about the duration of a visit. I would suspect that very short visits would definitely be a negative sign. I’m not sure that they could categorize those durations without actually asking about them, or if many people would respond. It was interesting seeing that they would check to see if people did actually visit the places recommended, and once arriving, if they would stick around. The geographical update working on google maps are awesome and it making it more flexible to every user in this digitalized era. Nice article. This has always been a sticky issue letting companies know where you are, what places you visit and so on. Google is staying away from sharing personally identifiable information. They often tell us in patents that is something that they strive to protect. I’m finding Google Maps approaches interesting, with location-based information being used to determine if people follow recommendations or follow search results that they see, and actually visit a place in person; and how that can boost a result or recommendation. It is superb and informative article. Google always comes with unique innovations and researches to maximize the living experience of human. With time Google always update itself to explore best accuracy. I’ve also found geographical update is working amazing on google maps. Thanks for sharing. The geographical update working on google maps are awesome. You know that I’ve been long time fan of your tweets. Today night, I’m searching about Google recommend and picked up this post title with SEO by the sea. And start my reading, I really impressed after reading complete article. Here, I first discover that Google check to see people geographic locations. Its my bad why I late to check the tweets you made. I missed the points and it seems that a big mistake for myself. By the way, you did a great job. I already noted those quotes. Those are amazing! Love the way you work dude. Great informative article. I am just wondering when the google bot is going to tell me how to run my entire life. Just kidding. It is very interesting how google gets smarter and smarter every day it is as if they are close to artificial intelligence. Thanks for sharing the info, love reading your stuff. Awesome article! I will say you are doing a good job. I have read many of your articles, they are very interesting and informative. Thanks for sharing.